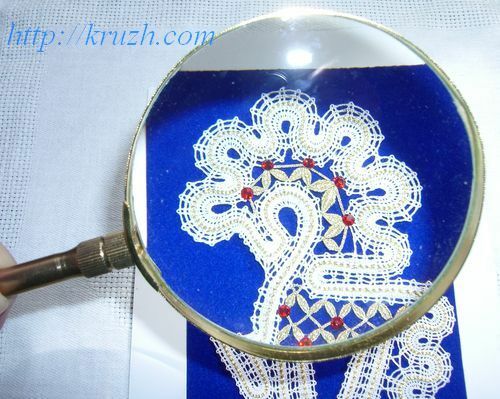 Bobbin lace making with thin threads demands good eye-sight. However keenness of sight trends to fall as far as a lace maker ages. This process accelerates if a lace maker neglects elementary rules of occupational hygiene. During all previous centuries premature falling of eye-sight was typical for lace makers who used to work by the light of a candle or a kerosene lamp. Museum guides never forget to remind this sad fact in history of the people artistic handicraft industry. Nowadays the rules of industrial safety provide prophylactic of eye-disease. The rules are general in many professions including watch assembling, fitting of microelectronic chips, sizing of small objects etc. Prophylactic is achieved due to hygienic methods (periodic relax, special exercises for eyes) as well due to special equipment. – magnification of a pattern image with an optical device. The work zone lighting depends on source brightness and source position. One can notice on all photos of lace plating that lace makers prefer to work in the shade of a tree (by dissipated sun light) or by the window in the room. If natural lighting is missing, the pattern is to be illuminated with local light source. Nowadays a great number of table-lamps are accessible. Total lighting of a lace pattern is to be the same as lighting of a text document, i.e. at least 1000 – 1200 luxes. A fluorescent lamp provides normal lighting at distance 20-30 cm (8-12 inch) from the pattern if its power is 50-75 watt. Some deviations of distance and power are possible depending on the pattern contrast, thread color and pattern background color. As a rule table-lamp has furniture for setting it near the pillow. Any optical device, whatever perfect, hampers lace making in some degree. 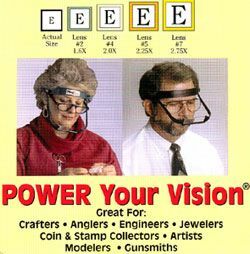 It restricts view field in order to increase magnification of pattern image. One is to find rational compromise between desirable magnification and inevitable narrowing of view field. Optical devices are useful for permanent application and can be used from time to time when thread is torn or thread knots arise. 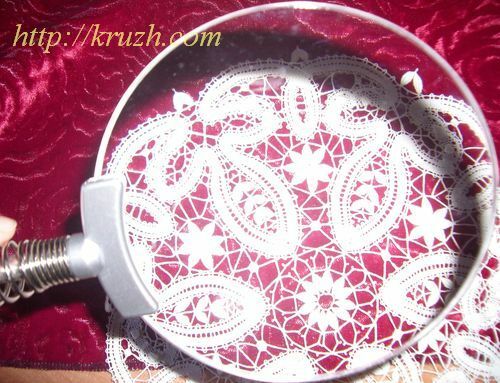 It is a good habit to make lace using optics that is suggested now in a great number. 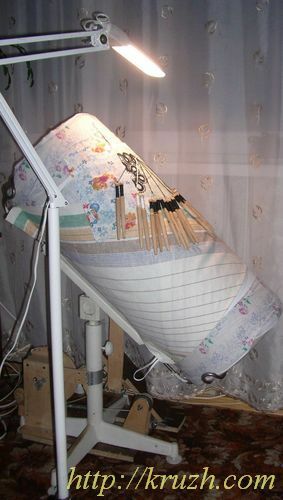 West Europe lace makers do not neglect the auxiliary optic that allows to plate for a long day without eyes straining (Fig.5.1). 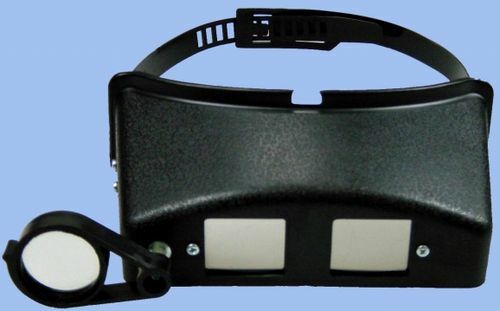 Assembly glasses (Fig.5.2) and optical mask (Fig.5.3) are accessible for lace makers in Russia. Magnification from 2 to 5 times is changed by means of auxiliary lenses. The devices adopted to head size. Device weight is less than 100 gr. 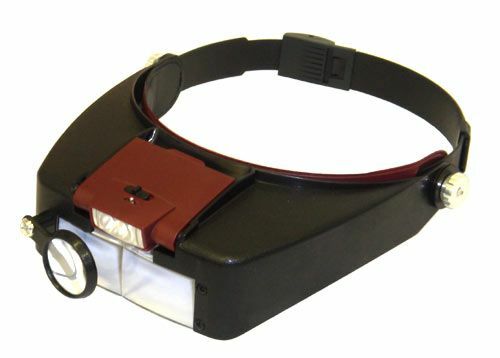 All the rest optical devices are magnifying glasses provided with a handle (Fig.5.4, Fig.5.5), a stationary support foot or a flexible support attached to the rest (Fig.5.6). General shortage of magifying optics can be compensated in some degree only by simple increasing glass sizes. Sometimes the glass is combined with a local lamp. This way was taken by designers of transnatiolal company LUXO that produced the row of glasses containig lamps. The lens of the most advanced model has sizes 175х108 mm. The glass is provided with the ring lamp that creates distributed lighting without shades. It is rather expensive device that is not accessible for every lace maker. “Magnifique Pro” is intended mainly for plants producing electronic devices. It can be used as well for checking notes and other financial documents. 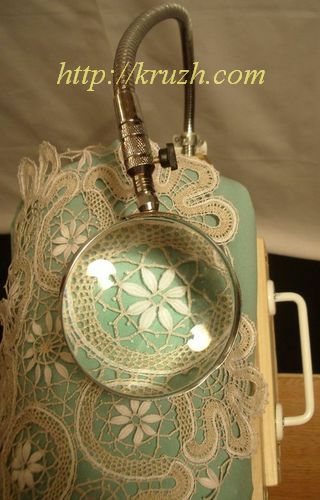 The magnifying glass with shadeless lamp yields to the simple glass with a table lamp in the respect of integral index “price + convenience in lace making”. One could not wait another result since optical devices “LUXO” were designed not for lace makers. Hower there are attempts to use complex optical equipment for lace making. Author’s work place is illu-minated with lamp that has three degrees of gyration freedom (Fig.5.7). Lens and glasses are used episodically.